Today: Nicholas gives us not one, but six dinner ideas out of an egg. Starting with shakshuka. This year I will feed my children too many eggs. Does this count as a resolution? It’s how I prefer mine: modest and resigned. Because this probably isn’t the year to join the high fliers who soar to high heights. It’s probably the year to do the same thing you were doing anyway. But to do it better. Which is why: eggs. When there is no dinner to be seen—not ready in the freezer, not gestating in the fridge—eggs are there for us. An embarrassing percentage of Isaiah’s body was built with egg protein: fried with sardines, over-easy on English muffins, scrambled next to roasted vegetables. You’ve heard of the flight-versus-invisibility question? There’s a poultry version: which would you rather have—the chicken or the egg? We pick the egg. Until our rebellious children become vegans and destroy our family forever, we live on eggs. But this year they will be better. A long time ago, someone misshelved eggs in the breakfast half of the day. As Tamar Adler has observed, this is unwise. 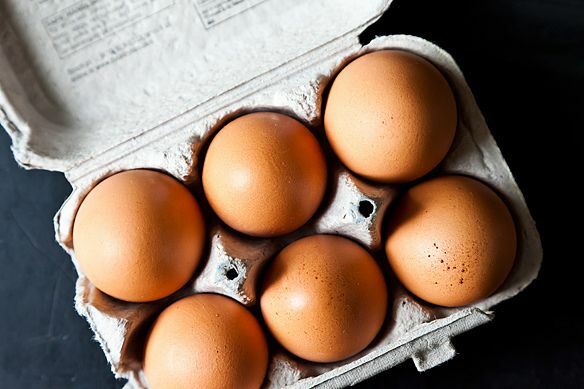 Eggs have an almost magical ability to transform whatever was in your kitchen into a meal. They’re like that reality show about the British nanny who comes and molds a dysfunctional household into a family-like shape. Eggs mold your dysfunctional ingredients into a dinner-like shape. For the New Year, I’ve assembled these half-dozen frames for eggs. They aren’t recipes, exactly, except for the last—they’re more like outlines. But together they’ll make your 2013 a double-yolk year. Fried rice: for the basics, see the Jean-Georges genius tutorial. But—and this is crucial—make it less elegant: add some hearty greens, a spare amount of abandoned canned tomatoes, some poor huddled vegetable yearning to be free. And then drench your egg in fish sauce, plus chiles. Explain to the table that anyone who doesn’t want their egg drenched in fish sauce is wrong. Restes: for braised leftovers—the liquid, the bits of meat, the mush of vegetables. Get your oven hot. Simmer up a good cup of leftover liquid and an equal amount of meat and vegetable scraps. Crack some eggs on top and bake until done. (Or do the whole thing on the stove: the same principles apply.) You’ll need bread. Pasta: but do I need to say this? For nights when even carbonara is too hard, there is no shame in serving your children pasta with olive oil and garlic and parmesan and a fried egg on top. (You’re never too young to start eating like a bachelor.) For any residual guilt: frozen peas. Frittata sandwiches: make your preferred frittata (mine is with a lot of sautéed chard and ricotta). Slice. Place on bread. Charge children $9 each and make them wait for a table. 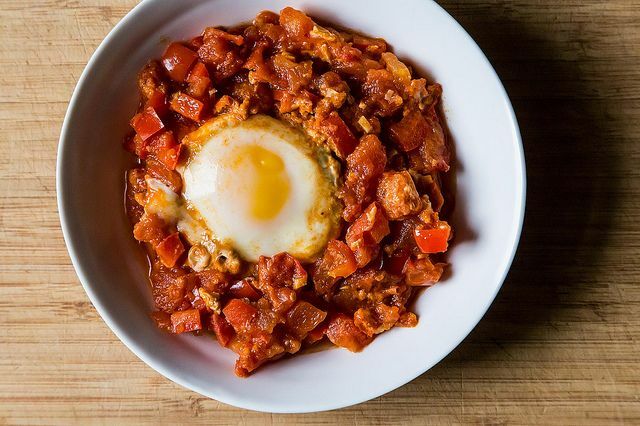 Shakshuka had its moment in the States recently, but I worry that no one noticed. If you did, carry on. 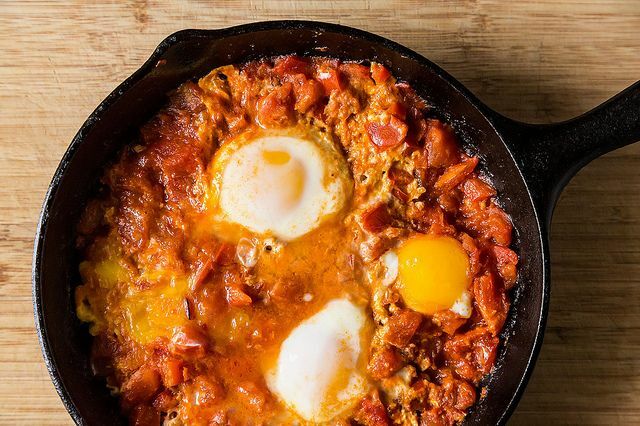 If not: Tunisian in origin, Israeli by adoption, tomato-sauced, spiced eggs. This version, tangy with dollops of yogurt, is from Yotam Ottolenghi and Sami Tamimi’s recent Jerusalem. We ate it the other night. It went well with biscuits. Baby Mila decorated the floor with tomato-flecked egg whites. I was feeling pleased with myself. Eggs are a fittingly metaphorical way to begin the New Year, I was thinking. They’re embryonic. “Dada?” Isaiah said, poking at his plate. Made this for brunch this morning and it was a hit with everyone. Easy to prepare and we found the amount of spices in the recipe just right. Totally delicious and I can't wait to do it again with the leftover sauce. Love eggs for dinner! Can't wait to make Shakshuka. The shakshuka was delicious. I do not know how I have lived so long without making this. Cheers! Thank you! Living in London I should be able to find this condiment. Sounds delish. Sambal oelek is a Malaysian/Indonesian chilli-based condiment similar to sriracha. There are a whole bunch of different kinds of sambal, but sambal oelek seems to be the most ubiquitous. I'm from Australia and it's readily available in the Asian section of supermarkets here, but I couldn't vouch for anywhere else. I feel dumb. What is sambal oelek? I must have made that Shakshuka something like 10 times since the book came out 6 months ago. I even made a big batch of it and portioned it out into freezer containers. I had to make my go-to pantry egg meal tonight due to the unexpected closure of my local Asian grocery. This is in fact the only pantry meal in my repertoire to date. It's a Malaysian-style curry with tomato, coconut milk, tamarind, spices, shallots and sambal oelek, with two soft-boiled eggs per eater and some rice. A total winner. Rosamund Man's book The Complete Meze Table has a number of good egg recipes, the most delicious is Fried Eggs with Lemon and Garlic, basically just as it sounds but with butter to fry the garlic, eggs into the pan, then lemon juice over the top, melding with the butter and garlic, then a little salt, some pepper and some ground roasted cummin sprinkled over to finish. Mmmm. Very hard to eat just one. Was wondering if you can make this in a cast iron skillet as shown in the picture above? I always thought you couldn't put tomatoes or anything acidic in a cast iron skillet. Good question -- we made it in cast iron because it was pictured that way in Jerusalem, and we also think that a well-seasoned cast iron pan won't be damaged by something mildly acidic, especially if you re-season the pan afterward. You must make the Changa Turkish eggs that Peter Gordon does at Providores in London. In one of his books, also in Conran's book on London eats. Fabulous. That sounds amazing. Thanks for the tip. When I am in need of comfort and are feeling particularly lazy, I make two fried eggs. When they are halfway done, I sprinkle them with salt and pepper. Then I layer some thinly sliced tomatoes over them top the whole thing with some grated old white cheddar. I pop on a lid and let the cheese get all bubbly and melted. I eat this over some toasted rye bread. I fell in lothinking about my egg-white, mayonnaise-free, egg salad recipe this morning as I was planning my tasty/skinny diet for my trip next week to St. John with my family. Notice I did not say, vacation; that's for singles and couples before or far after children. Soft polenta, quality jarred pasta sauce and a poached egg. A dash of fresh ground pepper and finely grated parmesan cheese. Yes. Polenta plus egg equals some sort of perfection. Moroccan meatballs with poached eggs in the cuminy, turmericy sauce! Big Frisee aux Lardon salad! I think I may need a video for the India eggs. I know! But it sounds more complicated than it is. You're simply letting the eggs set briefly and then folding them over. And repeat. Eggs are my comfort food and favorite meal. When I was little (actually when all of us kids were little), Mom use to hard boil eggs, coarse mash them with some fish sauce, and then mix the eggs into hot cooked rice. It was, and still is, the best meal for us. Fast and easy, it was ultimate fast food for little kiddies and we just loved it. I consider eggs to be a perfect food that comes in its own fragile container. My grandmother used the whites to make a heavenly angelfood cake for each her grandchildrens' birthdays and a batch of homemade egg noodle always accompanied that treat. Remember that scene in "Moonstruck" where eggs in a basket with roasted pepper are sizzling in a skillet - makes me hungry every time. Since we've moved to NM, my husband is addicted to eggs with green chili sauce, which he will eat any time of day. Versatile, helpful, yummy, incredible and edible - viva huevos.